Never Run Out of your Screen Printed Bottles and Jars. Let Us Manage Your Containers! Our 7,000 sq. ft. facility allows us to warehouse your screen printed containers and release them as needed. We work closely with APC Packaging and they are conveniently located 10 minutes away form our location. Blue Line Labels can help you manage your inventory and never run out of product. We like to print extra and not charge you until you are ready for delivery and we can ship the next day. APC Packaging is located 10 minutes from our facility. This is a big savings on shipping costs. APC offers a wide selection of quality and sophisticated airless bottles, acrylic and glass jars, tubes and caps in a variety of colors, shapes, sizes, and materials including, HDPE, Aluminum, PET, Glass, PVC, PP, SAN, and LDPE. We want to be your complete packaging solution for all your cosmetic packaging needs. Do you need help labeling your products? 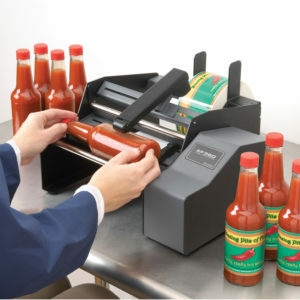 We can lend a hand on small to medium jobs with our in-house labeling equipment. We make it easy! Order your cosmetic packaging from APC Packaging and Blue Line Labels will pick up your order, label and ship them out to you. We take the hassle out of labeling and help with inventory control.